withdrawn Oc 1, 1954The IBM 702 Electronic Data Processing Machine, designed particularly for business use, also handled scientific and engineering applications. For example, an electric firm used it to solve scientific problems and process its business accounts; a machinery manufacturer prepared cam design reference tables on it, and the 702 was used in classified government projects that involved complicated scientific problems. The first 702 was demonstrated in l954, with the first production model installed in July 1955. Accompanying the 702 was the IBM 712, a newly developed, 1000-line-a-minute, high-speed printer, that used the principle of wire printing and provided more than six times the printing speed of previous units. The 702, which operated on the decimal system, incorporated a central arithmetical and logical unit capable of performing more than 10 million operations in an hour. The memory unit of the 702 contained a bank of 84 cathode ray tubes, on the faces of which thousands of decimal digits could be stored through the presence or absence of charged spots. Reels of magnetic tape fed data to the machine and recorded answers at the rate of 15,000 letters or numbers a second. One 2,400-foot reel of tape held information from 25,000 fully punched cards. 10,000 characters - alphabetical, numerical or symbolic available at the rate of 2.6 million characters per minute. 60,000 characters per drum -- available at the speed of 1.5 million characters per minute. 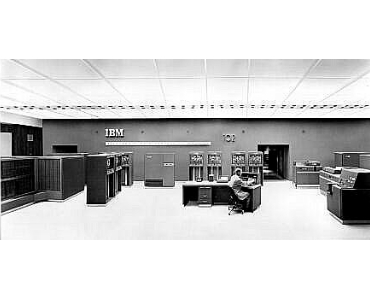 The IBM 702 was developed after intensive study of the requirements of IBM's commercial customers. It consisted of versatile units merged into a flexible, high-speed system that could perform the complete series of operations required for any data handling task. Fast input and output, large capacity electrostatic memory, and complete automatic control were characteristic of the 702. IBM 727 magnetic tape input-output units permitted masses of data to rapidly enter and leave the internal memory of the machine. Permanent files of records could be stored on magnetic tape at a great reduction in file space requirements. Card reading and card punching units offered an alternative means of input and output. Punched cards serving other areas of a business could thus be incorporated readily into 702 procedures. For preparing final reports, line printers were used. They could write reports directly from the 702, or could be used independently with tape units as tape-operated printers. All functions of the operating units were displayed at an operator's console, enabling the operator to inspect and observe any stage of procedure at will. A further operational aid was a typewriter printing unit which permitted communication from the machine to the operator. The Type 702 is a large-scale electronic data processing machine controlled by a stored program of the one-address type, utilizing various types of internal storage. The Type 702 EDPM is designed to fill the requirements of business for the handling of large amounts of data at electronic speeds. Several new and unique design features contribute substantially to the efficient processing of accounting data on the Type 702. Among these is the ability to handle variable size numerical and alphabetic fields with ease. A number of novel programming features have been incorporated into the 702 to facilitate editing input information and rearranging data within the machine for printing. To insure maximum flexibility, the input-output devices have been designed so that they can be combined, independently of the 702, to provide tape-to-card, card-to-tape, and tape-to-printer operations. The monthly lease charge for the IBM 702 central processing unit (CPU): $8,650.00. Features (of the 702 CPU):This unit contains an add-subtract unit, controls for effecting multiplication and division and circuits for comparing the contents of accumulator storage and electrostatic memory. Cathode ray tubes are the principal storage medium within the Central Processing Unit. These provide for the storage of 10,000 characters and two 512 character accumulators. Access time is 23 microseconds per character. All data to be processed by the various components of the 702 (except for auxiliary operations) must pass through electrostatic memory. An accumulator storage unit serves as a temporary storage for information which is being acted upon either logically or arithmetically. Determine the status of registers and counters. Display the contents of electrostatic memory and accumulator storage. The typewriter on the Type 702 can be used to print directly from electrostatic memory, one character at a time. The speed of typing is approximately 600 characters per minute. All other operations of the machine are held up during the typing operation. The typewriter has a 12" carriage and is equipped with a pin feed platen. Maximum length of writing line is 8 7/8", overall form width 9 7/8", and hole-to-hole dimension is 9 3/8". Any character not on the code chart prints as a question mark. A plus zero and a minus zero print as a plus sign and a hyphen respectively. Sensing the record mark automatically causes a carriage return and automatic spacing in accordance with the setting of the space control on the carriage. The record mark does not print. The main power supply is furnished as a separate unit of the 702 and supplies the necessary regulated power for the operation of the Central Processing Unit.